Today, we're celebrating one of our returning mentors: Greg A. Redden of MZE Architects in St. Catharines. Greg is a third generation architect at the firm, and MZE is celebrating its 60th anniversary this year. We asked Greg a few questions about himself, his experience as a mentor, and what mentorship means to him. Greg A Redden. Photo courtesy of MZE Architects. Tell us about your own success story. How did you get to where you are today? I was born, raised, and educated in Halifax, Nova Scotia. Upon graduating from Dalhousie University School of Architecture I designed my own sea kayak and started a skin-on-frame-sea kayak business where I taught people to building their own boat in five days. After a year-and-a-half of this, my wife and I moved to Annapolis, Maryland, where I started my Architecture career, as there were not very many opportunities in Halifax. After 3.5 years in the USA we moved to St. Catharines in 2002, where I have worked at MZE ever since. In 2008, I became an owner of the company. How did you get into mentoring? The Ontario Association of Architects (OAA), of which I am a member, has a program where members mentor internationally trained architects to assist them with obtaining registration in Ontario. I participated as a mentor in that program. Niagara Workforce Planning Board has a similar mandate to the OAA’s, and it only seemed natural that I might offer my time, should there be anyone in your program who is in the design profession and looking for assistance. How many mentees have you had so far? With NWPB, this will be only my second mentorship. With the OAA, I have mentored two more people who are now both registered architects in Ontario. What do you enjoy about being a mentor? Having an opportunity to aid a fellow human being is very rewarding, and I am comfortable with my understanding of how the design profession operates. Do you have any mentee success stories? My previous NWPB mentee is now working for a local architect, however, I am not certain if she has obtained her OAA registration yet. What do you consider to be the benefits of being a mentor? Being a mentor means that I can make a welcoming and positive contribution to the career development of someone who has chosen Ontario as their new home. I consider that a great benefit. What advice would you give to a new mentor? It doesn't take much effort to make a big contribution to the life of someone who might just need a little guidance and encouragement. As a professional, I think there is a civic responsibility to participate in shaping the communities we live in, and extending a helping hand is a satisfying way of showing appreciation and compassion for people who are in need of a little support to be their best in these new surroundings. I do not want to come across as a saint. I think it is the work of NWPB that is the real story – reaching out to make connections is the hard work. We thank Greg for his kind words, but we also appreciate his leadership and commitment to making Niagara a stronger and more compassionate community. The time he's committed to mentorship has made a direct impact on four lives so far, and as his mentees grow in their careers, the positive impact of his time investment will multiply throughout the region and beyond. Are you interested in contributing your expertise to the growth of Niagara's workforce? Are you a local leader who would like to mentor an internationally trained professional in your field? 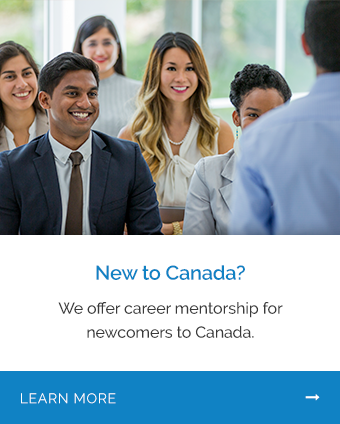 Or, are you a newcomer to Niagara interested in finding a mentor to assist you in establishing your career here in Canada? We invite you to connect with our Mentorship Manager, Josie Faccini, to start your mentorship journey today.